To enter the challenge you can make anything you like, from a card to a home décor item and anything in between. Just make sure you use lace somewhere on the project. You have until 11th November to enter and the winner will be announced on 18th November, so lots of time to get your entry in. All we ask is that you follow the theme and the simple rules that can be found in the side bar. The winners from week 40 Christmas can be found at the bottom of this post. Now let’s see what the team have made for us for this weeks challenge. All amazing creations I'm sure you'll agree! Anjie - As soon as I saw lace was the challenge I knew I wanted to use an image from the Rose Budd download Collection. The collection is also available as a CD should you wish to buy it that way. Miss Harriet is also available to buy as a clear stamp. The papers are also from the same collection. I have coloured the image with my Graph'It Makers. I have added the lace over the top of some vintage ribbon. This lace is just adorable as it has some small beads running along the middle of it. You can buy it from HERE. More details on my blog. Crafting Vicky This time around the challenge of using lace was a lot easier for me! Not so long ago I never used it at all but now I have a whole stash of it! When I decided to use the great Maddie Shy that you can also find in the great Pretty sweet collection. I really love the pink and the black together! 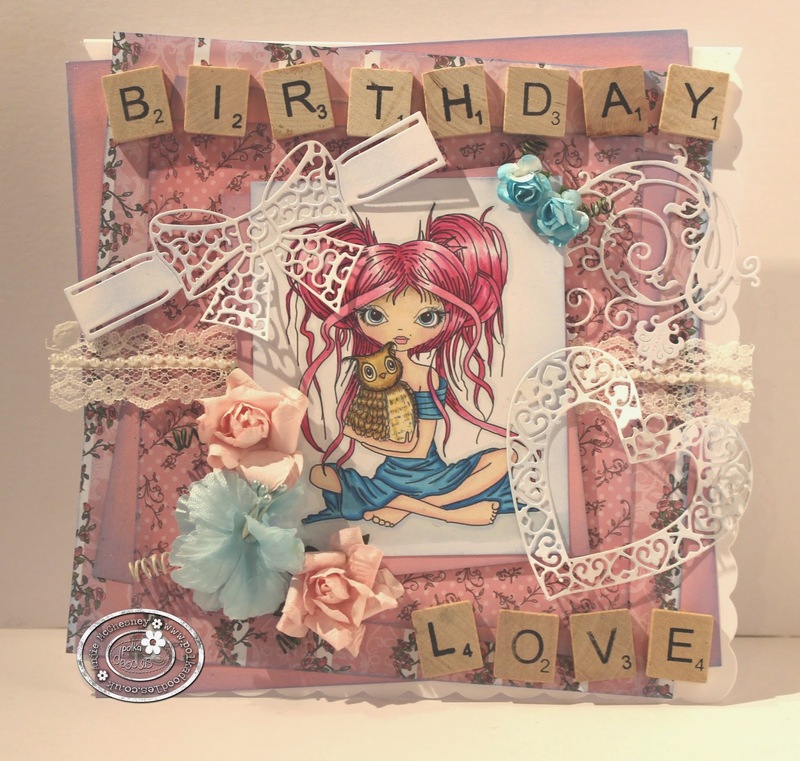 Wendy - I love lace, so pretty & girly, so this weeks card had to be pink. My image is from the Rose Budd Collection and also available individually.The backing paper is also part of that collection, it comes A4 size, but I've resized using Craft Artist. Tanya - Ooh lovely lace!!! I love love love lace and ribbon and anything girly so this week’s challenge theme is right up my crafty street. This week I have made a canvas that can be hung on the wall with the addition of ribbon or stood on a shelf to pretty up a bedroom. 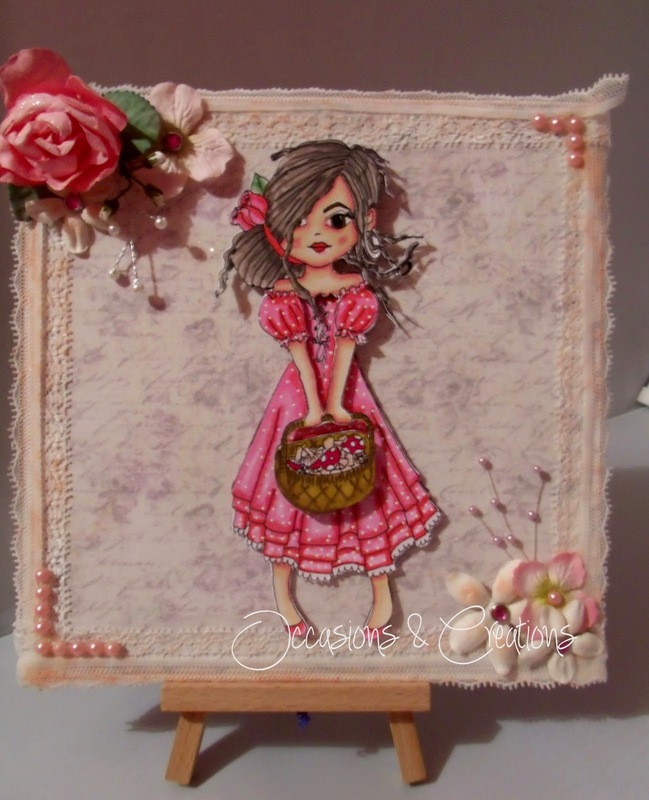 I have used the ever so sweet and girly Fredericka Libby digi stamp which can be found HERE and coloured her using Graph'Its (a full list of which can be seen on my blog) and coloured the lace slightly with Pan Pastel (380.8). 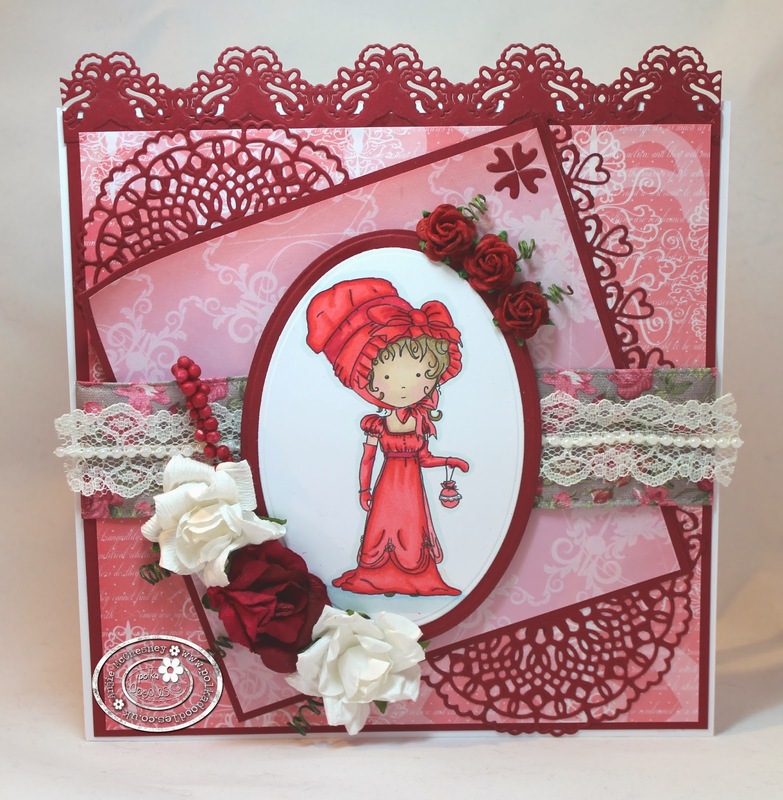 The lace and flowers are from my extensive stash of embellishments, full details of which can be seen on my blog. Patty - I've been using Lace a lot lately in all of my creations.... they are so delicate and lovely! so this was a easy peesy challenge for me. I used image and papers from Candy Doodles collection and some scrap pieces are from the clutter on my desk, sentiment is also from the collection. I like the lace and ribbon combination!! These birdies are so cute and just had to used them. 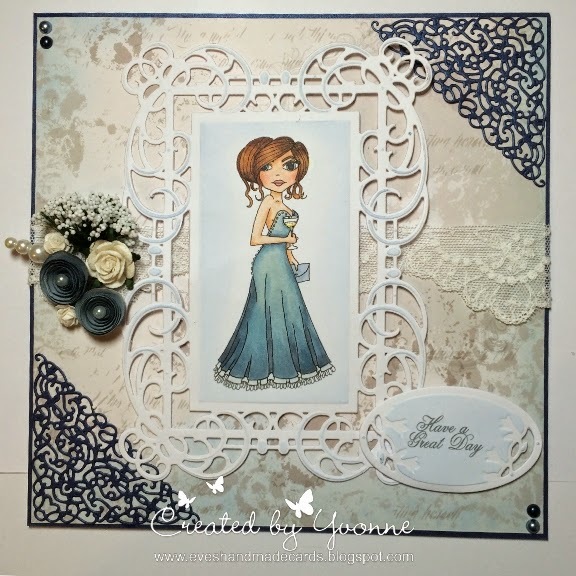 Yvonne - I LOVE this challenge, I enjoy all the challenges for Digi Choosday and have fun for every project, but this theme of 'Lace' let me be all girly and pretty and I loved it. 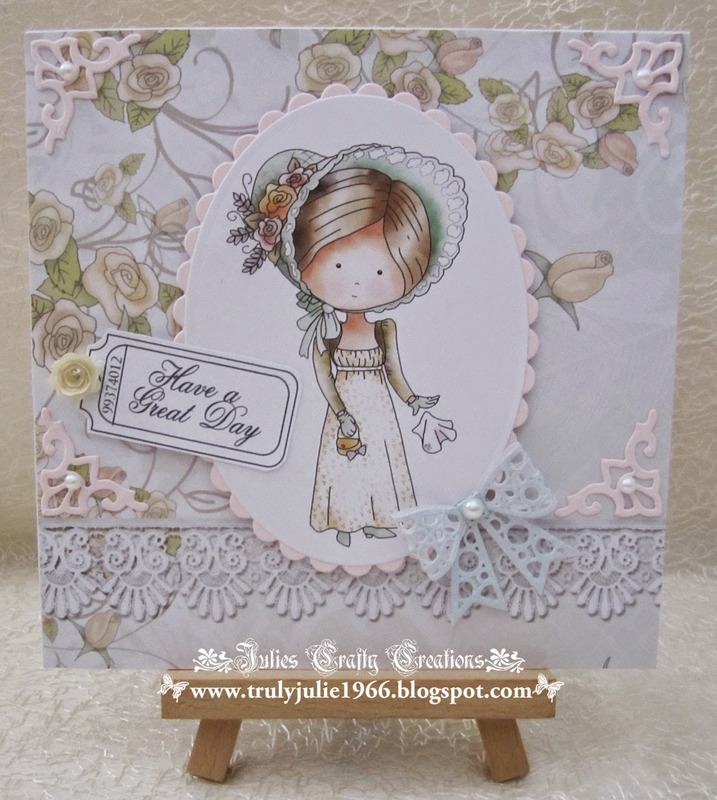 I used the beautiful image of Fredericka Debutante which you can get here, or in the Etsy shop or here. I coloured her with my Graph'It Markers. The backing paper and the sentiment are from the beautiful 'Rose Budd' Collection, which you can get as a CD-Rom or a complete digi download. You may not see it but the 'bubbly' in her glass is coloured with Graph'It Glitter Shake Marker in Gold. 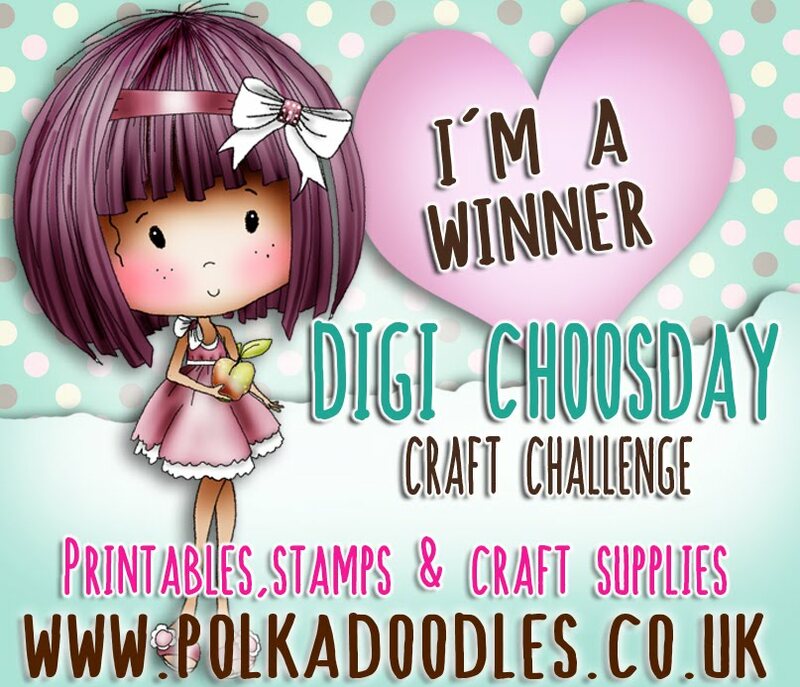 please email us at sales@polkadoodles.co.uk quoting DCwk43001wk40 to claim your prize of a free digi. Before we get onto this weeks challenge we would like to let you know that we have extended the DT call until 27th October. We have had some fabulous entries so far, it’s going to be such a tough decision! See HERE for details. Now did you know we are now officially one year old! It is one whole year since the Digi Choosday team was founded and what a year it’s been. 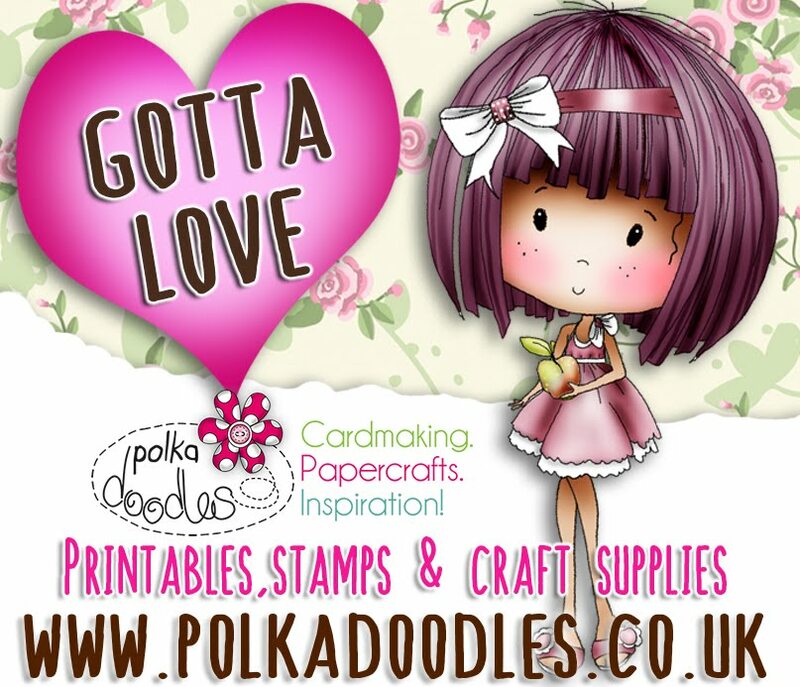 There have been some amazing releases from Nikky Hall this past year, and I’m sure the coming year will bring more fabulousness from Mrs Doodles. To enter the challenge you can make anything you like, from a card to a home décor item and anything in between. You have until 4th November to enter and the winner will be announced on 11th November, so lots of time to get your entry in. All we ask is that you follow the theme and the simple rules that can be found in the side bar. As this is a special occasion the winner will receive a free digi bundle from the Digi Store and our Top 3 faves will also all win a digi too! 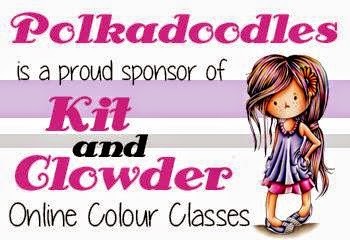 If you are not a member of our Facebook group here make sure you pop over and join us as we have loads of great fun stuff going on and little freebies and discounts so it's well worth joining us! The winners from week 39 Vintage can be found at the bottom of this post. Now let’s see what the team have made for us for this weeks challenge! Anjie - The image is the adorable new Octavia Best Friends, isn't she just adorable. She is flying out of the store. If you are wanting to practice your colouring I think this image is perfect for it with all that hair and the folds in the dress, so go on and grab it and get colouring. The papers are from the Rose Budd download, which is also available as a CD if you prefer. I went around the edges of the papers and the image with the pearl blue Pan Pastel, you can't really see it on the photo but it gives it a great glittery effect. All the die cuts are from Tattered Lace. The scrabble letters are from Docrafts and you can buy them here. The image is coloured with Graph'It Markers and the colours I used can be found on my blog. Scatty Jan Woohooo Ive been on Digi Choosday a whole year, it's flown past- To celebrate I've made a cake. The Papers are from Cherry Blossom Lane collection absolutly adorable collection , If I am ever stuck for papers there will always be one on here. 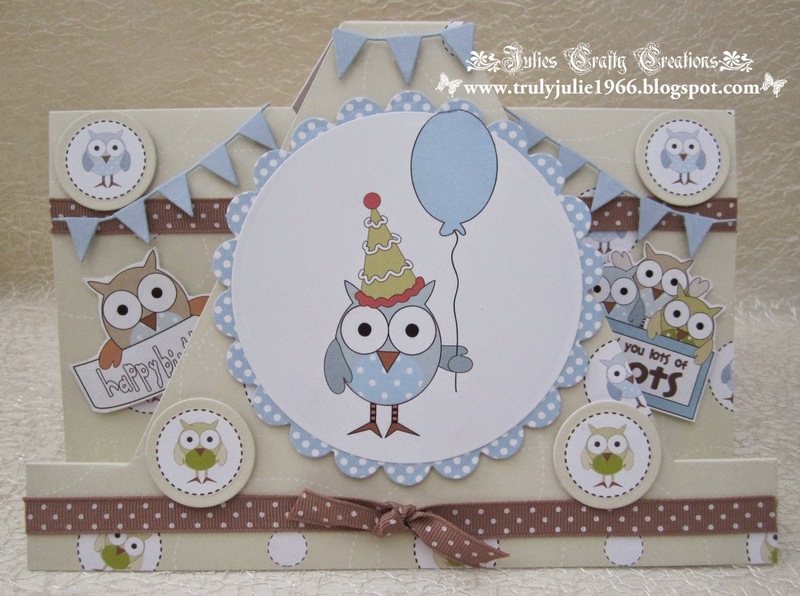 and the scrummy owl is from The Girls Hoot Download Bundle. 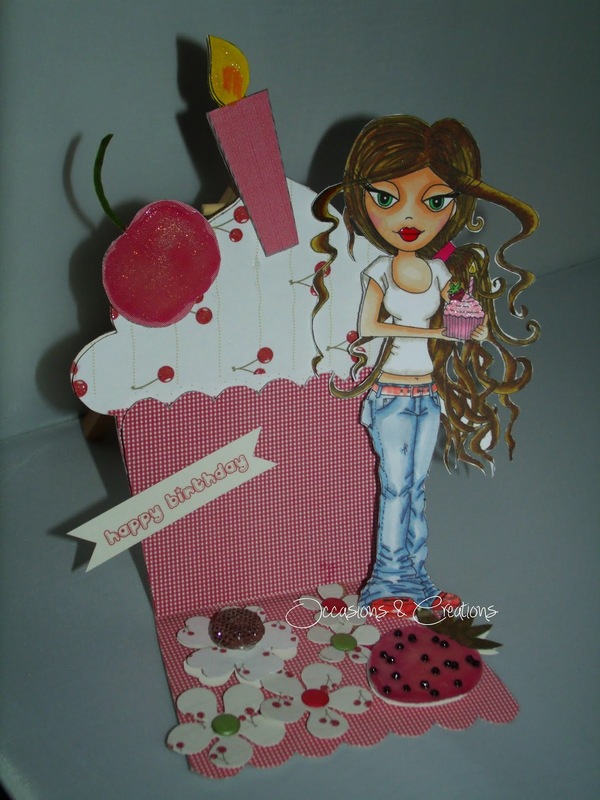 Crafting Vicky It's such a great challenge b-day!!!! And for a great occasion. 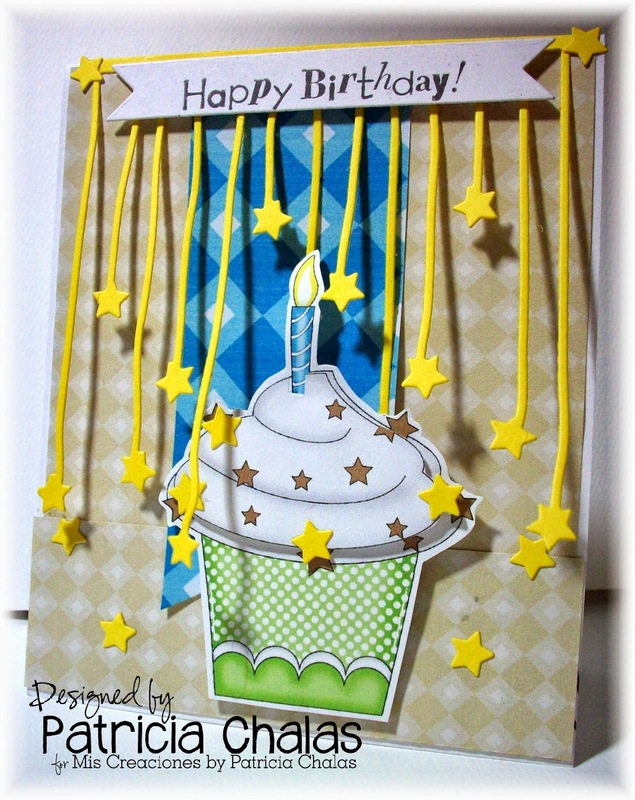 For my make I used a great character image from Cherry Blossom Lane collection as well as some papers. So here's my little make with this gorgeous. 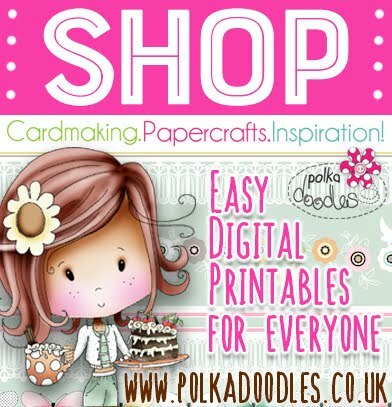 Everything I have used on my card, apart from the ribbon and bunting, is from the download bundle priced at only £3.99, a real bargain! 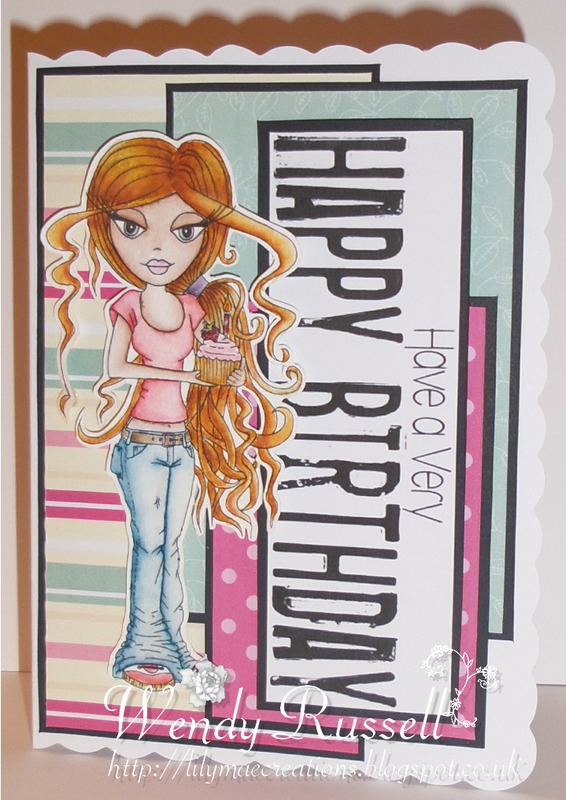 Wendy - For our birthday week I have used Dollie Daydream - Birthday image. The backing papers are all from the Enfys bundle, which includes 5 papers AND a digistamp for £2.25! The sentiment is from Work & Play 6. Tanya....Happy Birthday to you, Happy Birthday to you, Happy Birthday Digi Choosday, Happy Birthday to you. I am settling into my position as Design Team member very well and for my second project I have made a cake shaped card using Do Crafts Digital Designer and have used a Polka Doodles digi image called Dollie Daydream Birthday which can be found here HERE coloured using Graph'It pens (a full list of which can be seen on my blog). 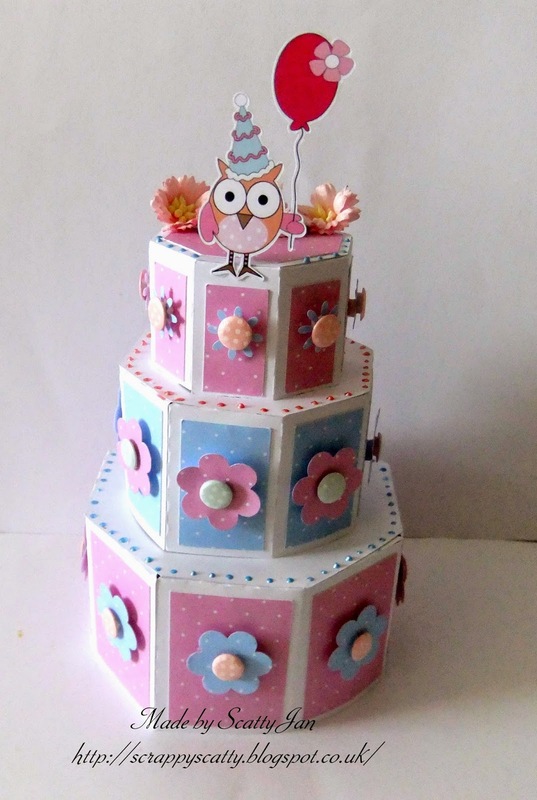 The cake shaped card has been covered using papers from Polka Doodles CD called Sugar Birdies CD. Full details of the other embellishments can be found on my blog. Yvonne - Well it's a Happy Birthday to Digi Choosday and I am very pleased that I get to be a part of this great celebration. Now you may have seen that the latest collection from Polkadoodles is 'Winston,' and the good news is this is now available as a full download digi collection or you can get this as a CDRom. Have to say this is a FAB collection and is jam packed with loads and loads of yummy goodiness. You can also get the characters as single digi images and Winston Birthday is available here. I coloured him in with my Graph'It Markers, you can see the full range here. Everything I have used on this card is from the collection. Patty It's a great challenge b-day!!!! For my make I used a great the cake image from Paper Boutique III and papers from Cherry Blossom Lane collection as well as some papers. So here's my little make for DC 1st Birthday!! Some fabulous makes everyone, thank you. Looking forward to the next 12 months! quoting DCwk42001wk39 to claim your prize of a free digi. Well done everyone go grab your badges from the side bar. See you all next week! Before we get onto this weeks challenge would you please all join us in welcoming a new teamie on board, a huge warm welcome to the lovely Tanya Miller We look forward to working with you. And don’t forget we also still have the DT call running until 20th October. See last weeks post for details. It’s almost the spookiest time of the year, a time for ghosties, ghoulies and other scary things to come knocking at your door! Will you be tricking and treating or just handing out tricks or treats to visitors? You have until 28th October to enter and the winner will be announced on 4th November, so lots of time to get your entry in. All we ask is that you follow the theme and the simple rules that can be found in the side bar. The winners from week 38 Buttons can be found at the bottom of this post. Now let’s see the spooky delights the team have made for us for this weeks challenge! Anjie - Instead of a card this week I thought I'd do some home decor so have made a canvas to hang on the wall. The image is cute little Amelia Witch and is coloured in with my Graph'It Markers. 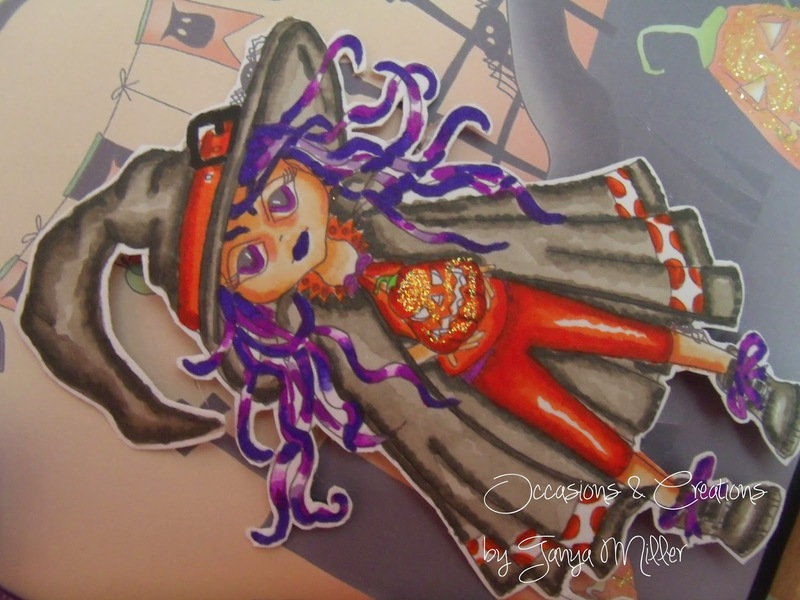 The rest of the elements on the canvas are from the Witchie Witchie download bundle. You can see all the details about the colour Graph'It's I used and how I made it on my blog. Scatty Jan Just can't beat a bit of Halloween. 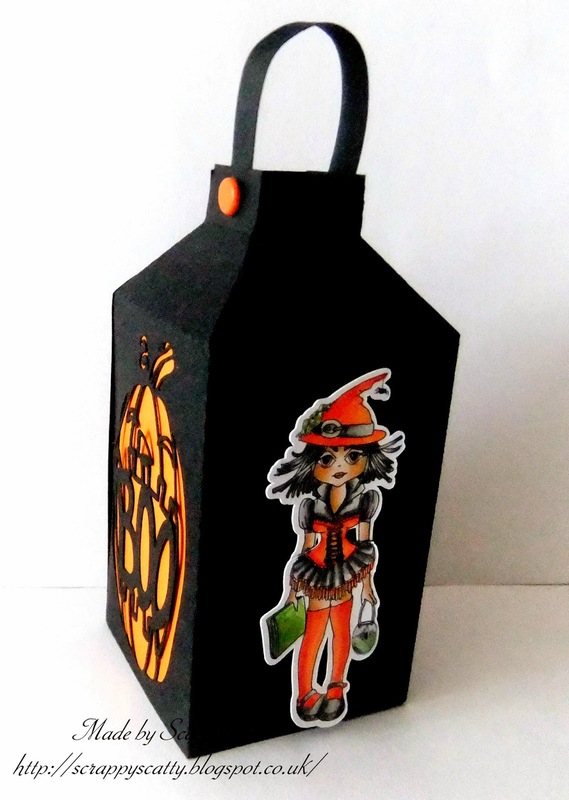 I have used the lovely Witchie Goth, coloured her with Graphic markers, (I just love the oranges) and placed her on the side of my Boo Lantern. Wendy - Halloween to me means bold, dark colours, totally out of my comfort zone! 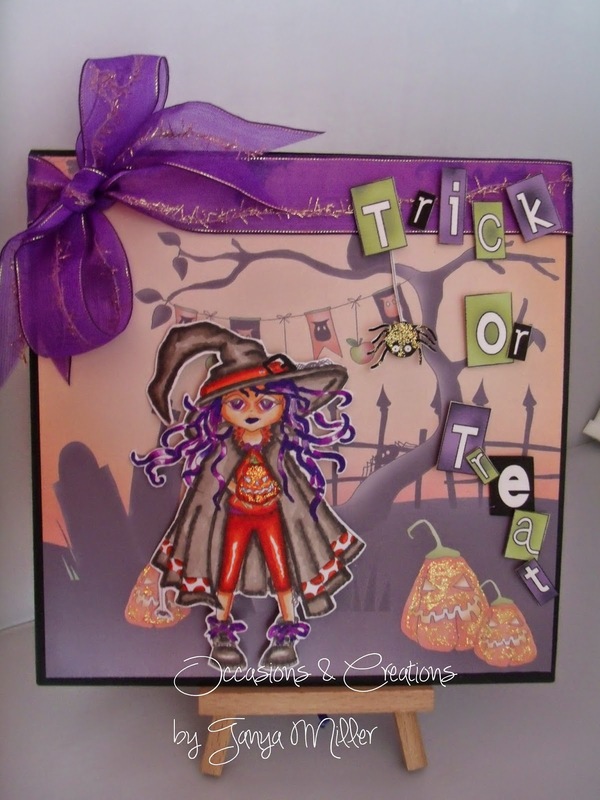 I've used a fabulous backing paper from Witchie Witchie bundle, as are the embellishments. The image is Kitty Kat, part of Nikkys new Halloween themed Digistamps. The moon is a simple circle of card, gently coloured with Yellow Ochre Pan Pastel. Crafting Vicky I was wondering what I could do that would be a bit different... and then I came across the great image Jack Pirate from the Bonbon Belles CD. I paired him with some papers from Pretty Sweet collection that I changed colors in my Word document for more orange. So this is my very first project as new DT member for Digi Choosday and also a first for making a Halloween inspired project too!! For this theme I have made an 8x8 square card and have used the digi image called Witchie coloured using Graph Its and the background is from Witchie Witchie Download Bundle 2013 finished off with Trick Or Treat lettering and spider from Sundae of Seasons CD and a helping of Cosmic Shimmer glitter glue and a length of chiffon purple ribbon, from my crafty stash. 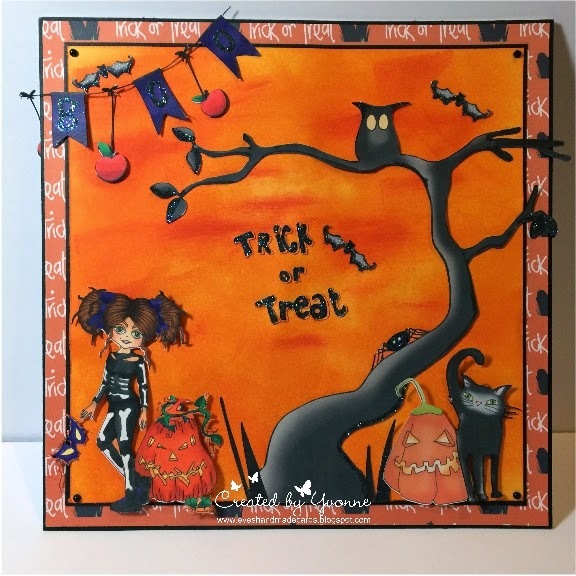 Yvonne - Hi there - well this week I made my very first Halloween card.............ever!!! I know! I also did another first and that was create my own background with Distress Inks!! I then put both of these things together. Honestly, the projects that I have done that I would never have dreamed of trying before, if I wasn't in a DT. Anyway, onto the exciting bits. I opted to use the image of Witchie Skeleton Digi Image which I coloured using my Graph'It Markers and you can see the range here. I then used some of the images from the fantastic Witchy Witch Bundle. Great bundle at a fantastic price!!!! 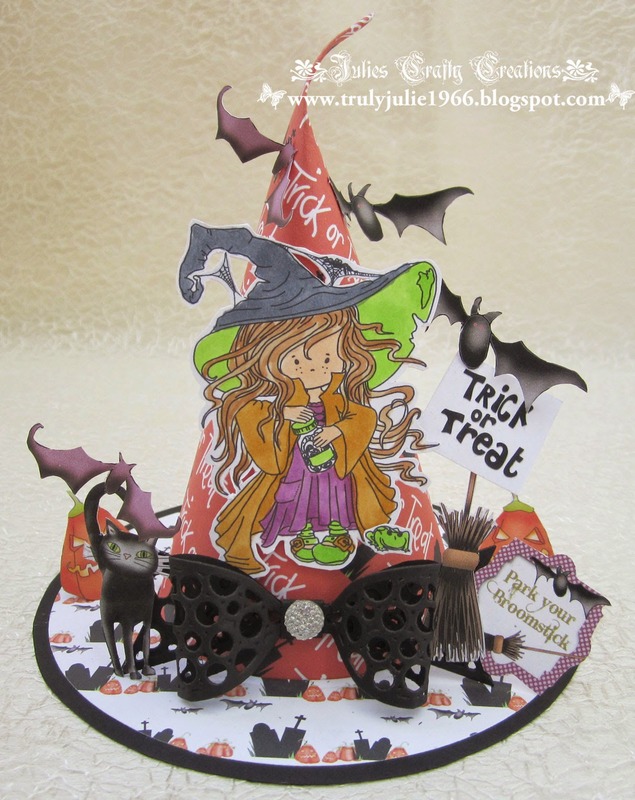 Hppe you like my first ever Hallloween card - see you next time! Great makes from everyone I'm sure you will agree! 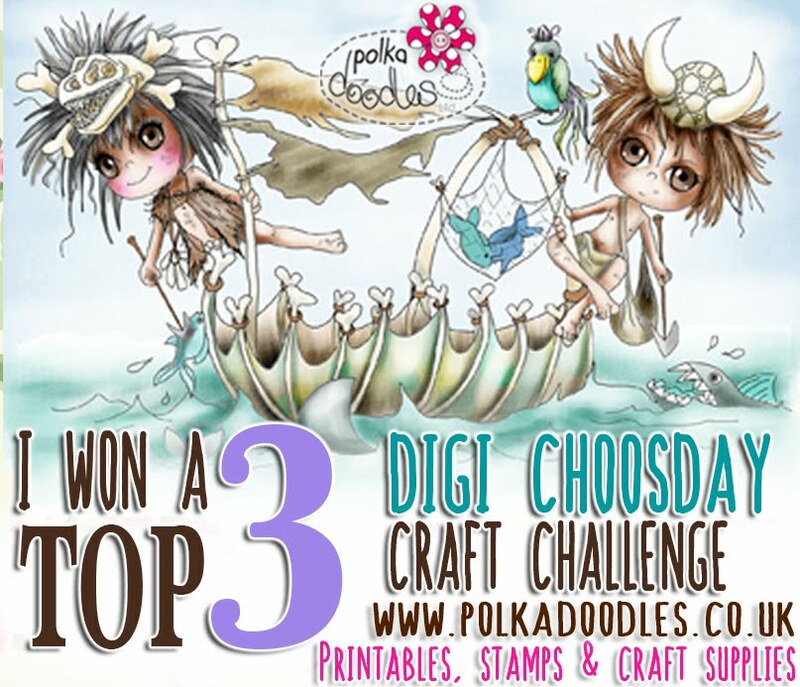 please email us at sales@polkadoodles.co.uk quoting DCwk41001wk38 to claim your prize of a free digi. To enter the challenge you can make anything you like, from a card to a home décor item and anything in between. All we ask is that you follow the theme and the simple rules that can be found in the side bar - you don't need to use our products to enter either! Don't forget it's the Digi Queens day over at Polkadoodles too so hop over there when you've finished this post and see what the other team have made today! You have until 21st October to enter and the winner will be announced on 28th October, so lots of time to get your entry in. The winners from week 37 Christmas in Blues and Purples can be found at the bottom of this post. 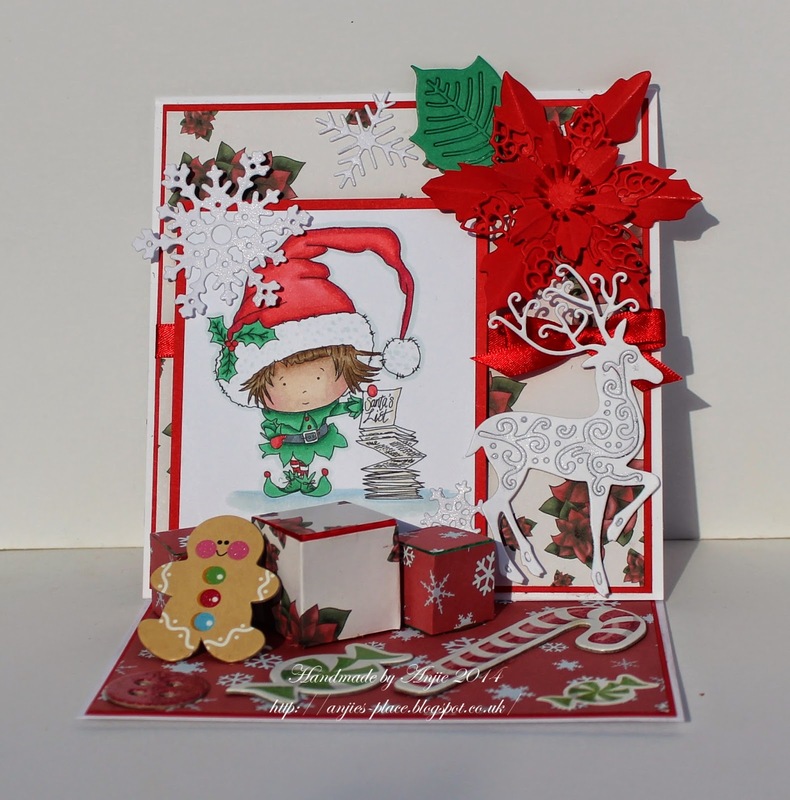 Anjie - The cute image and papers are from the Work & Play 5 Festive Hollybobs download. This is also available as a CD if you prefer and that can be found here. The image is coloured with my Graph'It Markers. The little boxes have been cut on my Cameo and covered in the papers from the card. The die cuts are from Tattered Lace. Crafting Vicky I just LOOOOOVE Christmas so happy to be able to be able to get ahead of the game by making some :) For my card I used the fabulous set Christmas Joy bundle. There is so much in that little set. And I love that the images are precolored makes for a very fast little card! I really love the navy with the green color combo. 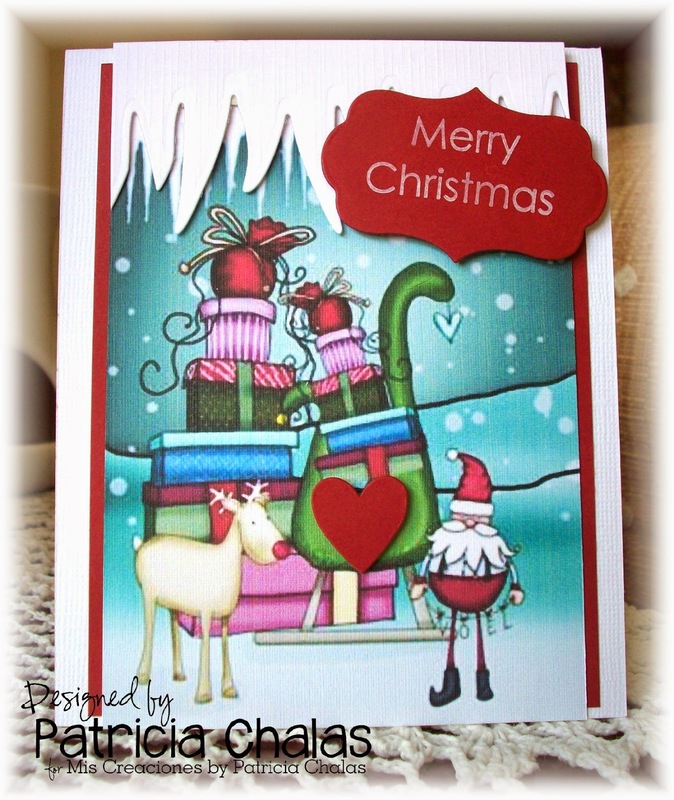 Patty - For my christmas card this time, I've used colored image of Santa Scene from the Magical Winter I collection, he is also available as an individual found on the same CD collection, all papers are from my stash use a cut heart as 2D element and the white snow too and on a single cut out shape I stamped the sentiment Merry Christmas using snow white ink. Wendy - For my christmas card this time, I've gone with more traditional colours. I've used Santa from the Festive Hollybobs collection, he is also available as an individual digi here or as a clear stamp here. I've coloured him with Graph'its. 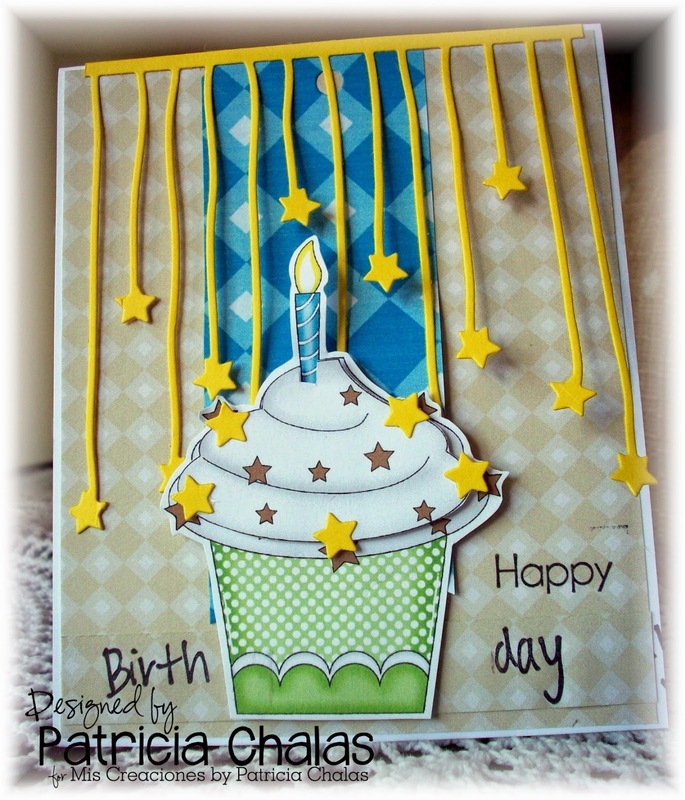 Both backing papers and all the embellishments & sentiment are from the same collection. 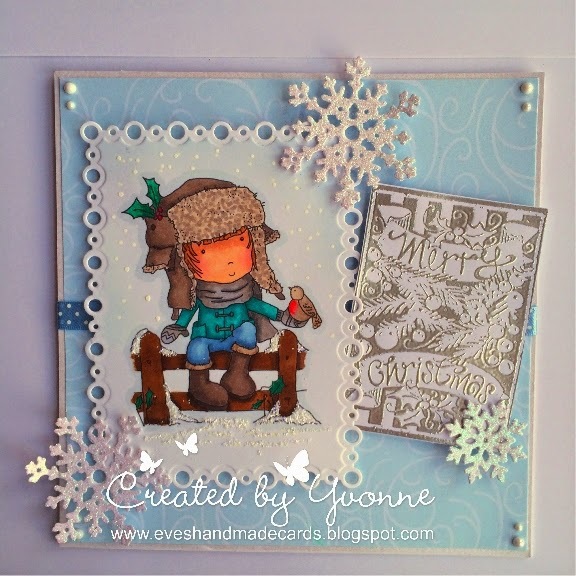 Yvonne - I love Christmas, love it love it love it! So I loved this weeks challenge. I have used 'Boy With Robin' from the fantastic Work & Play Festive Hollibobs Collection, you can get this as a CDRom, digi collection, digi image. I coloured the image with my Graph'It Markers - you can see the range here. 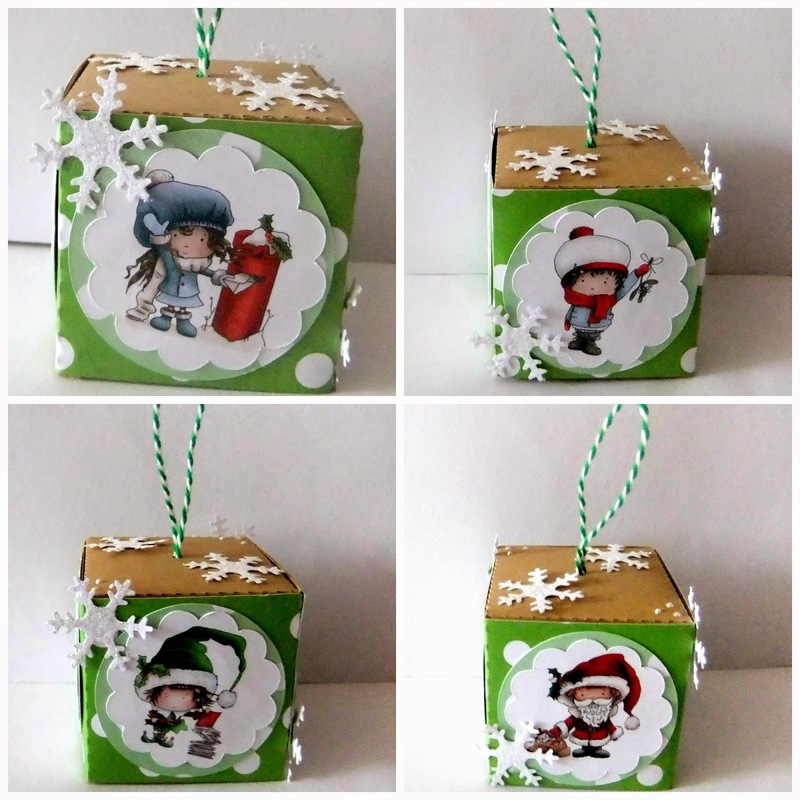 The Christmas sentiment is one of the Chalkboard Stamps which you can get here. I stamped it clear and embossed it in silver. I think it's a great effect, do you? The backing paper is also from the Festive Hollibobs collection. I added a few snowflakes and gems from my stash. Fabulous makes from the whole team, I'm sure you'll agree! 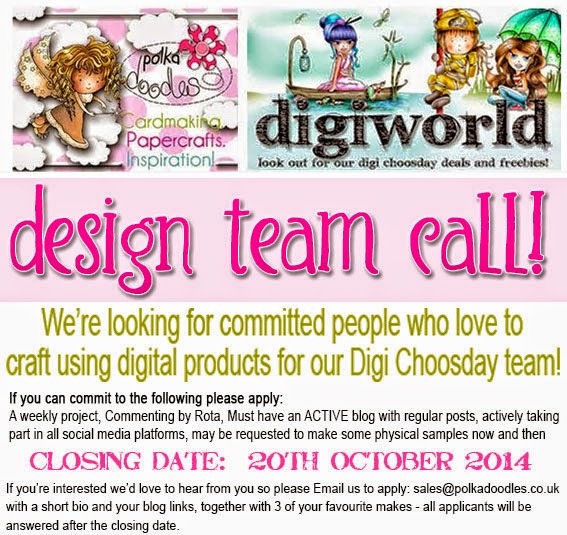 please email us at sales@polkadoodles.co.uk quoting DCwk40001wk37 to claim your prize of a free digi.